This folder contains three excellent articles on the early days of the French Grand Prix. The race was initiated in 1906 but canceled from 1909 through 1911 as the French absorbed disappointing losses in 1907 and 1908. The race returned in 1912 only to be interrupted after 1914 by World War I. This article was originally published in the June 28, 1906 issue of The Motor World. This is a very strong summary of the first French Grand Prix in 1906 - the first auto racing grand prix in the world. This article was originally published in the July 1906 issue of Motor Age. Like other coverage of the first French Grand Prix in 1906, this article is critical of how the event was conducted and the ulterrior motives behind staging it. This is historically significant because it was not just the first French Grand Prix, but the first grand prix auto race anywhere. Attached is great coverage from Motor Age of the 1908 French Grand Prix won by a German factory worker, Chirstian Lautenschlager, who also won the 1914 French Grand Prix. 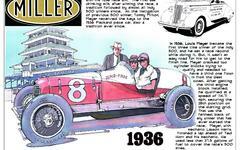 Lautenschlager also competed in the 1923 Indianapolis 500. This article complements another on the 1908 French Grand Prix found elsewhere on First Super Speedway. The first three attachments below contain articles about the second French Grand Prix that were published in the Indianapolis Star in July 1907. The fourth attachment contains an article on the same race that appeared in the Indianapolis News. The attached articles from the Indianapolis Star published in June and July 1908 disuss preparations for the upoming French Grand Prix, the first Grand Prix auto race - the inaugral event occurring in 1906. This brief article first appeared in the December 5, 1909 Indianapolis Star. It concerns the on-again, off-again status of the French Grand Prix. Established in 1906 the race was a response to the limitations of cars originating from any one country in its predecessor race, the James Gordon Bennett Cup. France was the dominant car producing nation in the world and expected to walk over all other countries in their own race.